My new workplace is super casual, and while I know there is nothing stopping my from throwing on my pencil skirts and heels like I've always done, lately I've been feeling more comfortable in jeans and button downs. Often I will throw on a blazer and heels, but when it's really cold out, boots and a sweater tend to win out. At least it's not a bad look to have on repeat. And yes, definitely not the worst look to be repeating all the time...if it were, I'd be in trouble! I love the animal print with the red, they pair very well together. I love sweaters paired with buttons downs as well! This is super cute i Love the leopard sweater. What a seriously awesome sweater! I think this is a pretty perfect look for a casual office. I love animal prints - great look as always, Lydia! I can imagine with the cold you really want to be as covered, warm and comfortable as possible. I like this, you still manage to look polished. Your leopard sweater is so sassy:) Happy Tuesday, lovely. No, it's not at all a bad look. You look stylish and gorgeous in this relaxed look. Colder months of the year puts the biggest pressure on what to wear. Love that sweater! You can still be chic and casual. Looks good. You can never go wrong with a classic casual look like this, love it on you! 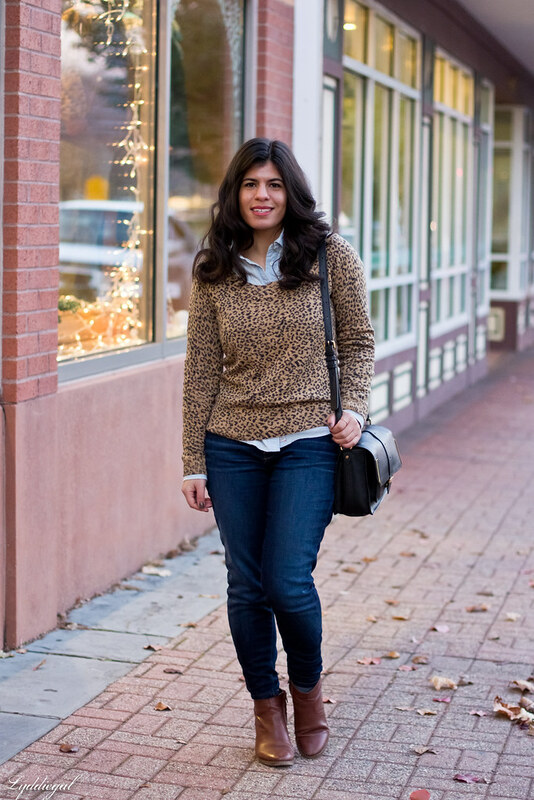 I'm loving your chambray shirt and leopard sweater together! So perfect. My workplace is the same way so I understand. Dressing casually has its good and bad points. You look great though! I think it's important to still look put together and you do! Gorgeous outfit, I love peek-a-boo collars for this season. Plus, love the pattern on that sweater. 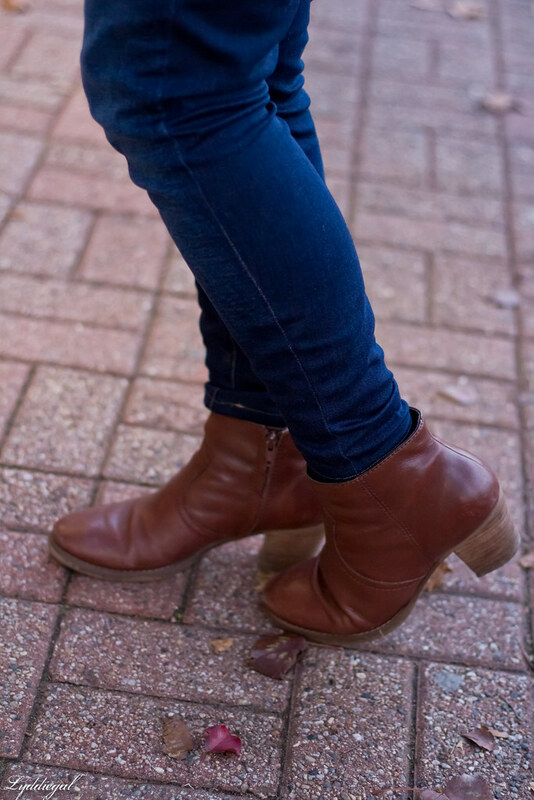 great brown booties. still looking for the perfect pair for myself. i will check out these! I dream of a casual office! I envy you - not because I want to wear jeans all the time, but because sometimes, when it's really cold and rainy, it's nice to have the option :) And besides, jeans can be so easily dressed up, as you've clearly proven here. 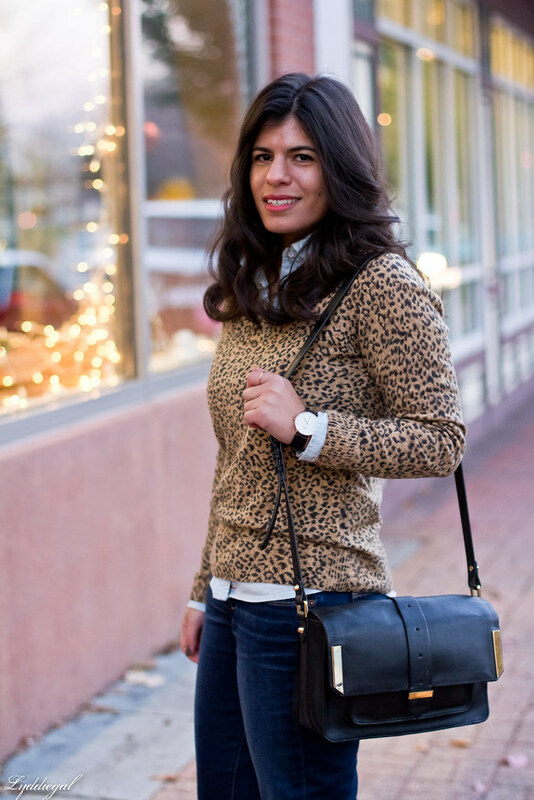 With that bag (again - I'm swooning) and your lovely leopard sweater, you look decidedly professional without sacrificing style. That sweater is amazing! I love how it looks with the chambray underneath! This is cozy, cute perfection! 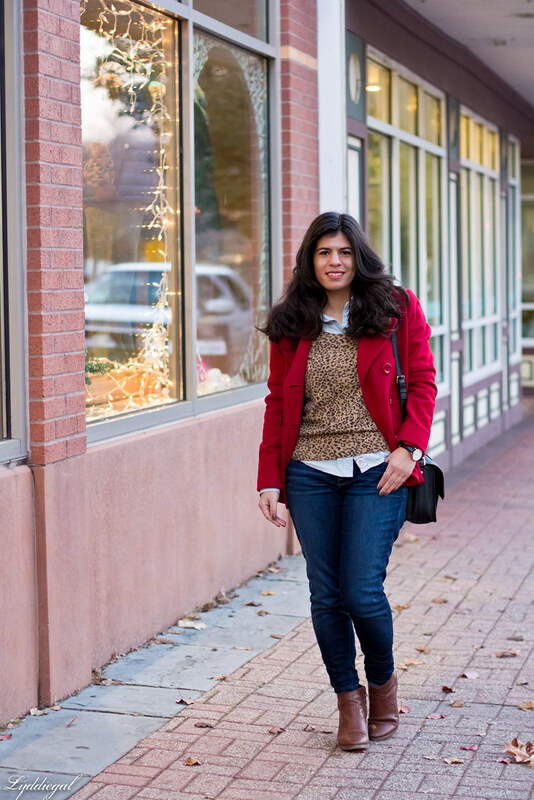 I love the leopard + jeans + boots combo, especially with the red coat. My office is pretty casual too, which is really nice on those cold days! 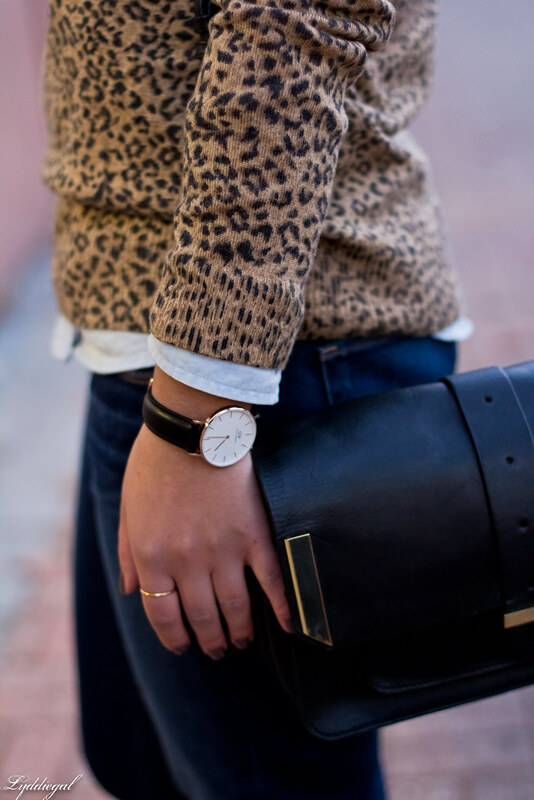 Loving that leopard sweater! Happy Thanksgiving! This is definitely not a bad look to have on repeat! 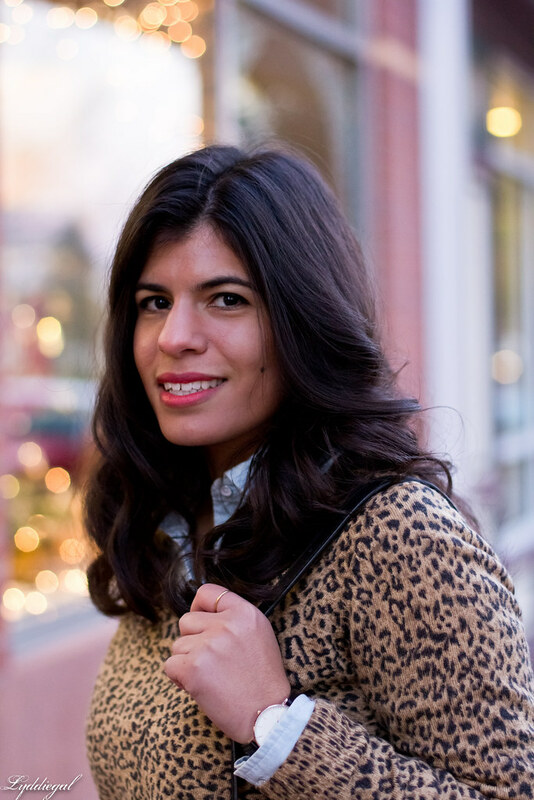 I love the leopard sweater and the pop of red from your jacket. This is a great casual chic look! So nice to have the option to dress up or down. Love the layers. This is my fall uniform too. Congrats on your new job. What do you do? My job is the same way. I can dress pretty casual. I certainly love your chic, casual and put-together outfits. Wearing trends that are classics, also. The red coat makes it all better also. Have a Great Thanksgiving Lydia!